alaTest has collected and analyzed 187 reviews of Prestige 50669. The average rating for this product is 4.4/5, compared to an average rating of 4.4/5 for other products in the same category for all reviews. Views about the price and performance are generally positive. The maintenance and design also get good feedback, whereas views are divided on the size. There are some critical views about the noise and durability. We analyzed user and expert ratings, product age and more factors. Compared to other products in the same category the Prestige 50669 is awarded an overall alaScore™ of 82/100 = Very good quality. Strenght of coffee excellent. Stays hot and does not drip. Water runs throuigh filter too quickly and therefore the resulting coffee is not strong enough. Also coffee is not hot enough. Would represent good value for money if it were more efficient. the hot steam from the top. Love the auto timer, hot coffee waiting for me when I get up in the morning (and it stays hot for 2 hours). Best electrical item I have purchased for quite a while. Good value for money. 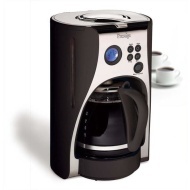 It delivers what promised, fresh coffee ready when you wake up.....what else can you ask. Easy to clean as any other filer, fast brewing. I'm happy with my purchase. Small footprint. Cannot argue the value for money. Does exactly what it says. Makes Coffee. Everything about it is good. I cannot find anything to criticise and it is used all day, every day.